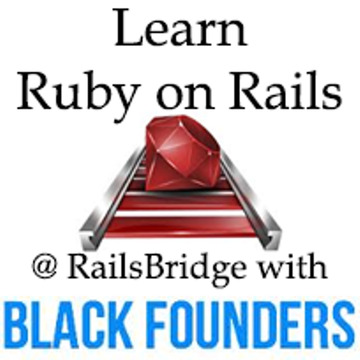 Come learn ruby on rails with RaildBridge and Black Founders on March 15th and 16th @ WestEd. 5pm: Join us to have a celebratory beverage and talk shop at a nearby pub TBA! Sign up process: Attendees should be the official RSVP-er, with a +1 for their guest(s). Everyone is welcome at Railsbridge, but we strongly encourage people of African (black) and Hispanic decent to attend this special RailsBridge event co-hosted by Black Founders (www.blackfounders.com) to increase ethnic diversity among the Ruby on Rails development community. Transportation: WestEd's office is located in downtown San Francisco, on Harrison Street. If you are taking transit, use the Montgomery Street BART/MUNI stations. If you're driving, there are several parking garages in the area as well as metered street parking. Bikes are not allowed in the building and there is very limited bike parking (i.e. parking meters) outside. Workshop Description: This workshop is intended to reach out to people of African descent who are interested in learning Ruby on Rails and encourages ethnically diverse participation and everyone is welcome to attend who wants to learn Ruby on Rails -- ask your friends if you aren't sure who might be interested! 2) If you have a Mac, download and install Xcode on your laptop before coming to Installfest on Friday. (Xcode is the software that creates a coding environment for you to tinker with during the workshop.) Xcode is a very large file that takes 2-3 hours to download. Doing it at work on Friday is totally legit, waiting until Friday night at the installfest is not. The installfest instructions for getting Xcode are here: http://installfest.railsbridge.org/installfest/install_xcode. 3) Fill out the Registration Form that we email to you. It will provide us with details about your operating system, the type and level of programming experience you have, and other questions. You must fill out the Registration Form before 5pm on Monday 3/11/13 so we can get the final list of attendees and allow waitlisters to take open spots. Please note: The security at the WestEd building is very tight and your name needs to be on the list we provide to guards in order for you to be allowed inside. Please fill out the registration form (via email) so we have this. If you need childcare, please comment on this meetup form so I can start working on arranging it. A: We will be offering the beginning and the intermediate levels of the curriculum at this Railsbride. You must take the beginning curriculum at least once before you "graduate" to the intermediate curriculum. Let us know via the emailed registration form which curriculum you want to take, as many beginners choose to go through beginning curriculum multiple times to get more comfortable with it.